I was out shopping and toy hunting when I came upon these fancy looking blindbags at my local Target. I took a look and thought "why not" since they were only $1.99 and I was getting a couple of the other blindbag stuff from Mega Bloks and CBR anyways. I bought 2 and so far the one that I've opened is apparenty a rare one-at least that's what the checklist sheet says. There about the size of a lego minifigure and seem to be made of something fuzzy like felt with a crown studded with a jewel(the package mentions something about searching for the real crystal but I don't know if they mean one of the crowns-which was pictured- or the fact that the rare one is named crystal). There are 21 royals(kings, queens, sultans, ect.) with each having 4 different variants except for the princess crystal one that comes in 5 for a grand total of 85. 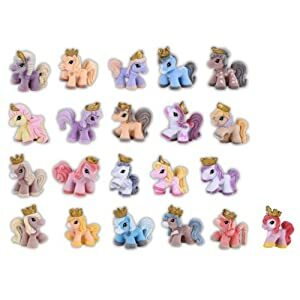 Considering the number of blindbag toys I've been seeing I think it's only a matter of time before we finally get some of the MLP ones. I have one of these they're cute! 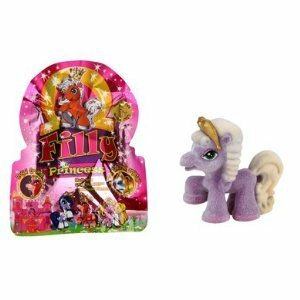 I think the MLP blind bags might be Europe exclusives - but I might be wrong! There was a post about this in Off Topic a while ago, aren't they cute! I have several of these. On my most recent trip to Target I bought 5 more, and one of those five was Princess Crystal. So far, I have sixteen, and two of them are duplicates. I really want Princess Pretty but I haven't found her yet. At this point, though, I'm almost afraid to keep buying these since they're not identifiable without opening the bags like the MLP blind bags are, so there's too much of a chance for duplicates. At my Target, they're in the very last aisle near the checkout with all the trading cards. I don't know if it's in the same spot at every store, but if you find where the trading cards (Pokemon, sports, etc) are, you should find them. I remember seeing these at a calender store that comes in our mall for a couple months a year. They wanted way too much, so I didn't pick any up. I wouldn't be surprised if our Target had them. I will have to make sure to check it out. And I wish we could get the actual blind bags in the US. We have a store around here that sells extra stock from other stores and they had a bunch of blind bags for a while, but I guess they all sold out. I have one. You can find them at Toys R Us here. 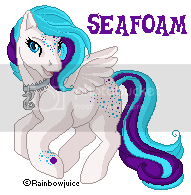 I have some of these, though my favorite set is the one before this (Just titled 'Filly'). I have a bunch - I found like 150 bags at Value Village (overstock from somewhere LOL) and bought them all. I've opened two - but finding a girl and a boy, I didn't want to break my luck by opening more. So I trade and use them for swaps! I found them at Toys R Us in California right before christmas... My boyfriend got me one and some zwinkies cause I was good while he did his christmas shopping! hahaha! Dido for me too. Though I've only seen it at one Target(as of yesterday) it's in the same section I usually find my other collecting toys. From what I've gathered, the US ver. is by Irwin Toys and I guess the older ones were released by a company called Flair. Amazon has some playsets that are random collect and combine rooms.